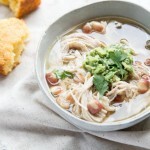 This Easy Green Chile Chicken Posole Soup was inspired by a recent trip to Oakland and the Swan Market. 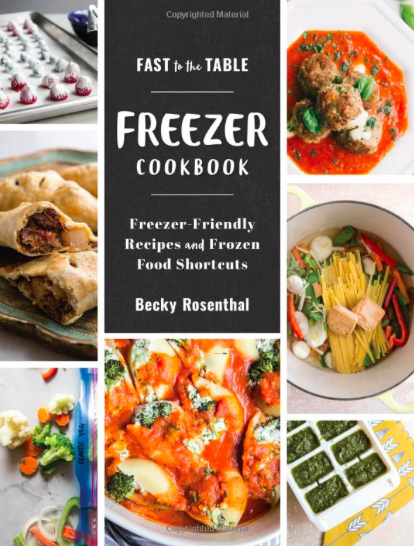 Travel always inspires the best recipes! One afternoon we stopped by the Swan Market for lunch and our noses lead us to Cosecha Cafe. Fresh tortillas were being hand made while their homemade, bone broth pozole verde bubbled in the open air kitchen. We tore into a fresh tortilla while waiting in line to order. I really wanted a big bowl of posole but the green hue of the soup strayed me toward the sweet potato quesadilla instead (I’ll tell you more about that one later). You see, I’ve had multiple allergic reactions leading me to the ICU a couple years back for consuming unknown green chiles. 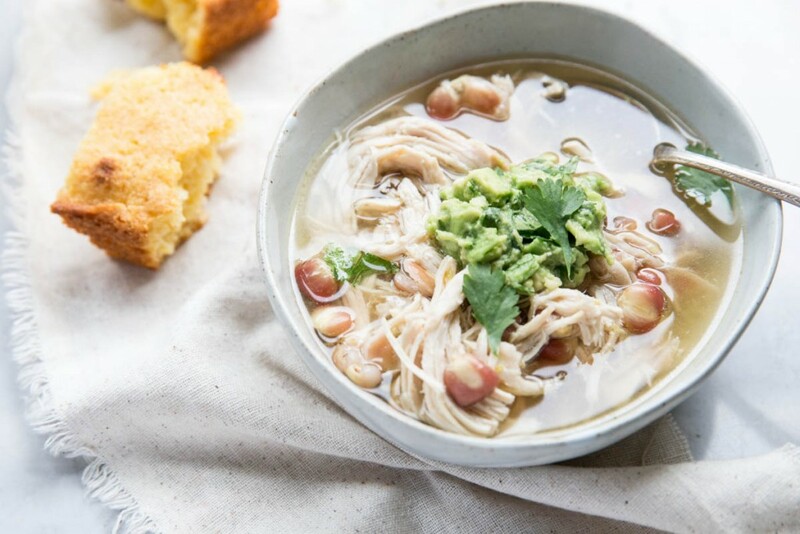 So, when I passed on this sweet smelling green chicken posole that day, I knew I’d just have to remake it at home with ingredients that I knew my body could handle. For my version of this recipe, I use a bone broth that I previously made as the base. The hominy I use is a beautiful purple hominy gifted to me by a dear friend. You can find dry hominy in most grocery stores near the dried beans or in the Mexican food isle. If using dry hominy, you’ll want to soak it overnight before starting the recipe (just as you would with dried beans). 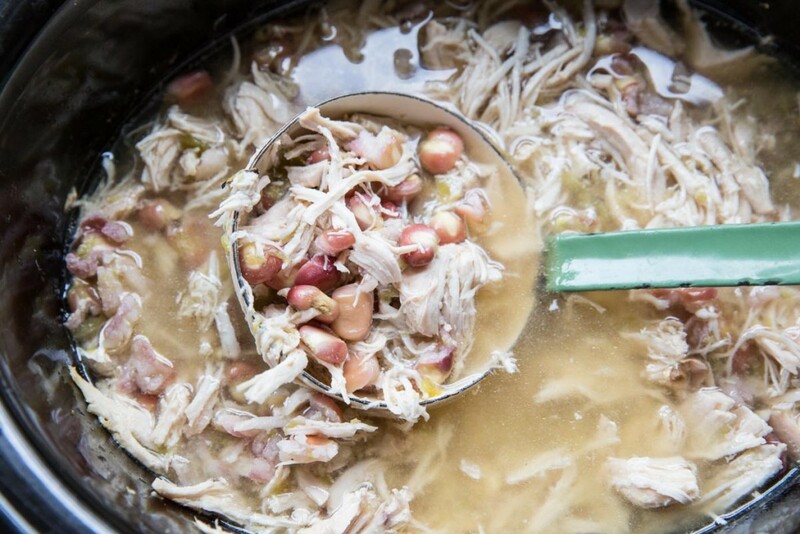 If you decide to use canned hominy, you can wait until 30 minutes before the chicken is done cooking before adding it into the slow cooker since its already cooked. 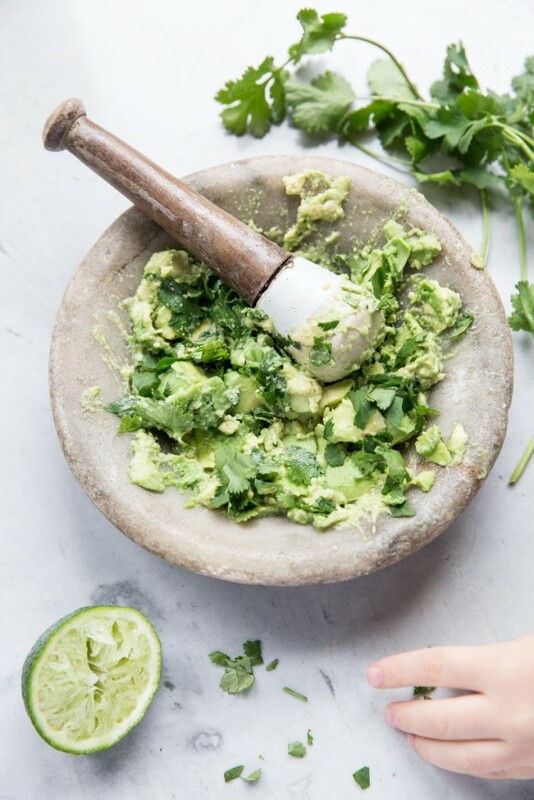 This recipe literally needs no chopping, no real prep, just a little forethought and some hands-off time. I use hatch green chiles because I know I’m not allergic to them and I prefer their sweet and spicy flavor but you can use any green chiles that you like or jalepenos. Two tablespoons of green chiles results in a mildly spiced soup, while 1/4-1/3 cup of chiles leads to more heat. 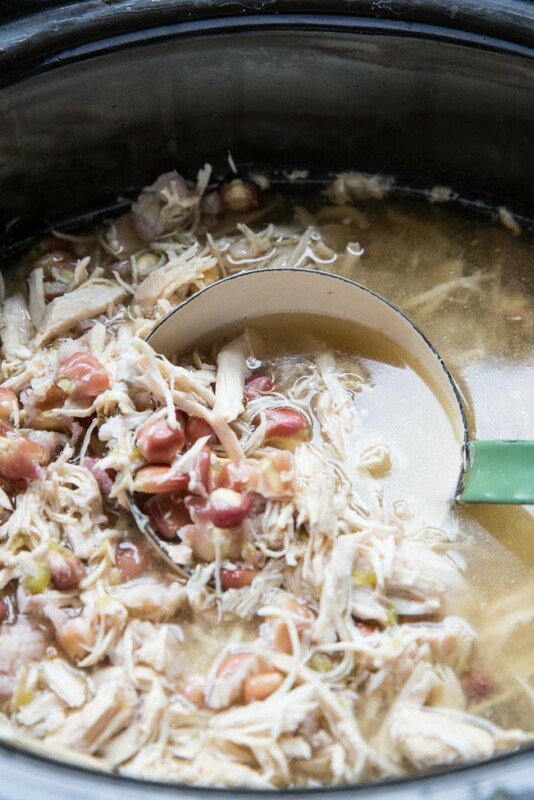 For a more complex posole try my original posole recipe (we enjoy this on Christmas Eve). 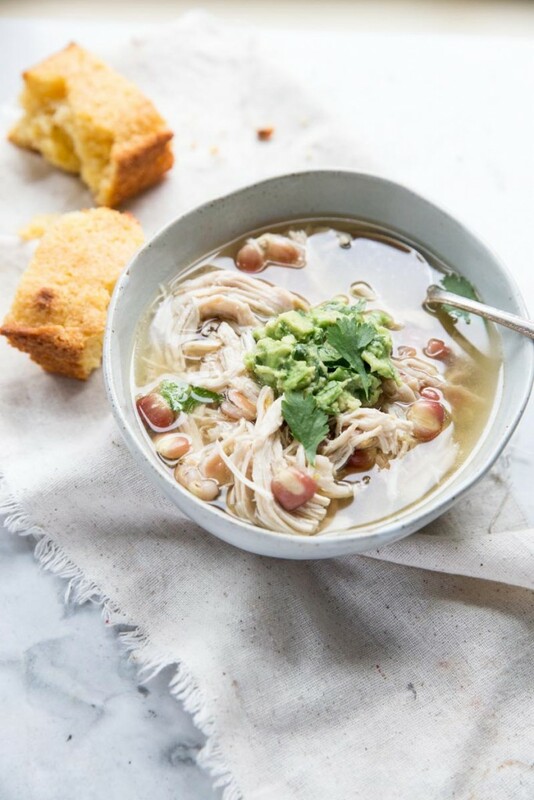 We enjoyed this simple posole with cornbread and topped with an avocado lime mash that I included a recipe for down below. This recipe is perfect for Cinco de Mayo or any old day! Thanks to my friends Diana who lead us to the Swan Market for this inspiration! 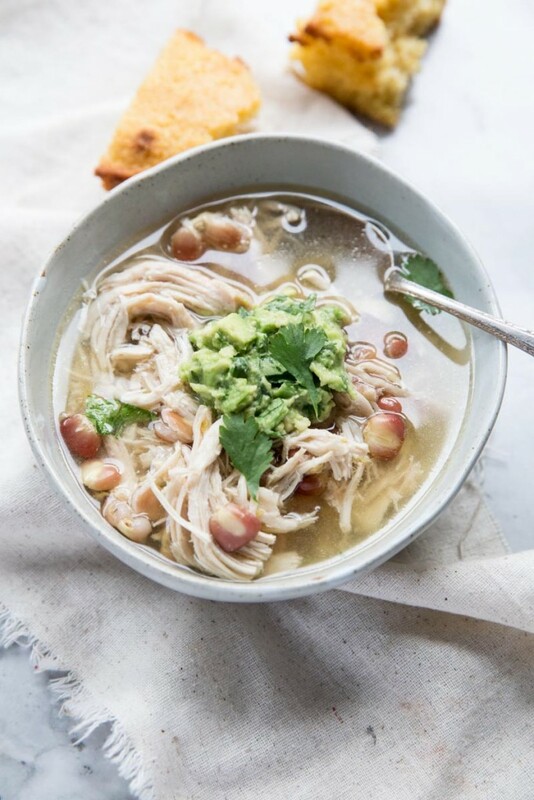 A simple and easy slow cooker recipe for Green Chile Chicken Posole Soup, often called Pozole Verde. 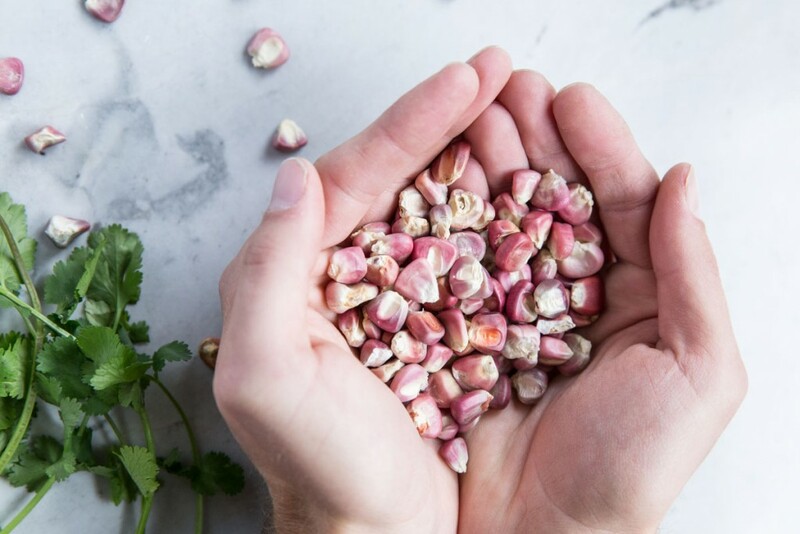 In a large bowl, soak dried hominy in water (covering 1-2 inches) overnight. 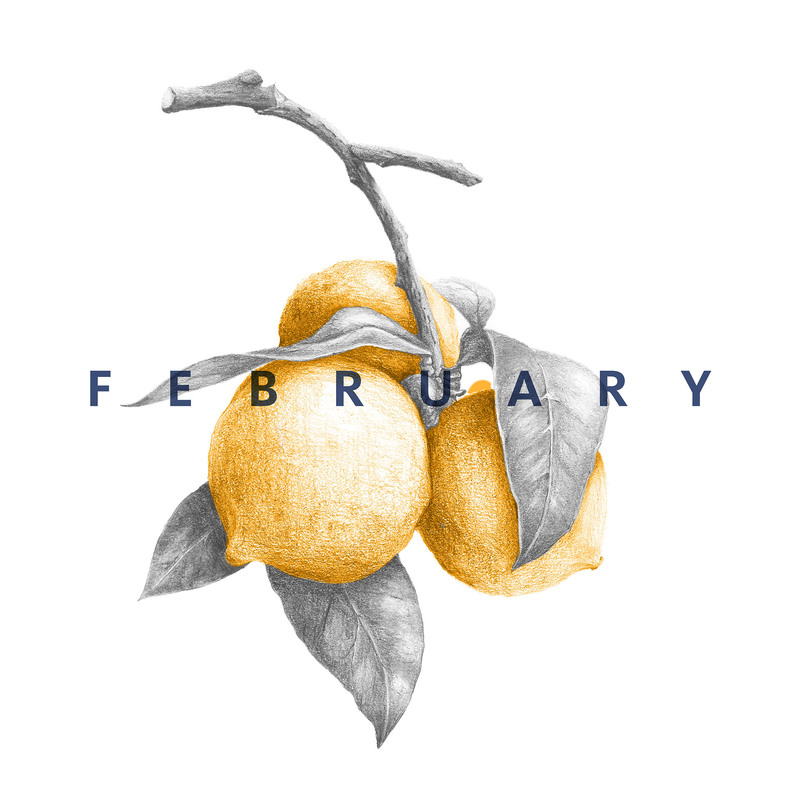 The following day, turn on your slow cooker to high. Drain and rinse the soaked hominy and add to slow cooker with the broth. Cook on high for 1 hour. Then, add in the chicken, chiles, 1 teaspoon of salt 1/8 teaspoon cracked pepper and turn the cooker down to low. Cook on low for 6 hours. Shred the chicken and adjust seasoning to taste. Serve warm with cornbread, and avocado*. If using canned hominy, you'll want 3-4 cups, drained and rinsed. This soup is great served with a avocado lime mixture to cut the heat. See additional recipe below.